Glenfarclas 21 Year Old malt whisk. An incredibly rounded whisky that leaves you refreshed and contented. A whisky that always deserves a second glass. 21 Years Old 43% Vol. 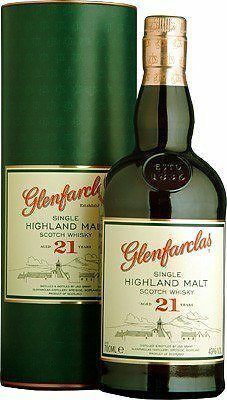 Glenfarclas 21 Year Old malt whisky. My personal favourite. Flavour: Full bodied rich and rounded develops slowly into fruity, smoky and spicy flavours. Finish: Long-lasting, smooth a smoky with a chocolate feel at the back of your throat. Comment: An incredibly rounded whisky that leaves you refreshed and contented. A whisky that always deserves a second glass. My personal favourite.